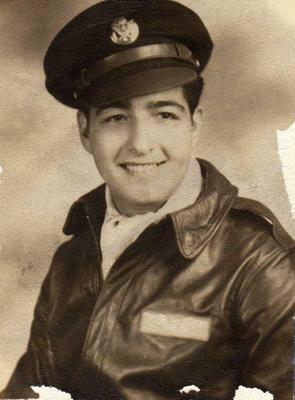 S-SGT Weido Chipoletti 376th Heavy Bombardment Gp., 515th Squadron James P. Bishop Crew. S-SGT Weido Chipoletti was the nose turret gunner with the James P. Bishop Crew stationed at San Pancrazio, Italy. He flew 36 missions from July 1944 thru March 1945 and kept a record of all 36 mission on the back of AMC ( Allied Military Currency ) Notes. Pictures of two of these notes are included in this submission. 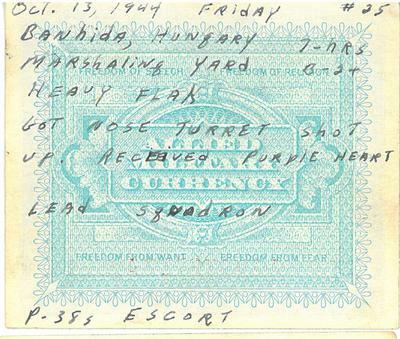 The two notes are his record of getting shot up in the nose turret on *Mission #25 10/13/1944 Banhida, Hungary Marshalling Yard (awarded The Purple Heart) and *Mission #27 where they were shot up over Vienna and had to ditch in the Adriatic Sea. 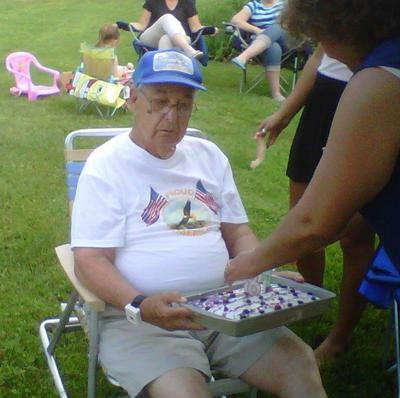 Also his service photo and a photo of him 90 years old 4th of July 2013. He flew the tough Ploesti missions in the summer of 1944, Vienna, Toulon France Sub Pens, etc see *Mission History. 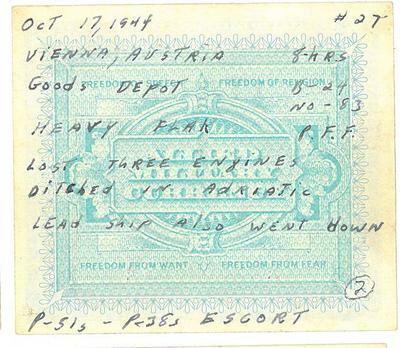 October 1944 was a Bad Month for S-SGT Chipoletti. Nose turret all shot up on Friday the 13th 10/13/44 Mission #25 and Shot Down on Mission #27 10/17/44. After getting shot up on mission #25 he could have gone home but stayed, What a Hero and Patriot. They are truly the greatest generation. After getting shot down on 10/17/44 their next Mission on November 5th 1944 was right back to Vienna. Mr. Chipoletti is 91 years old and doing fine as of 7/22/2014. This submission is with the approval of his sons Jay and Neal Chipoletti. A combination of Ed Clendenin's Book 376th Heavy Bomb Group Mission History - James P. Bishop crew and Mr. Chipoletti's notes verifying these missions. Neal, sorry to hear about your dad. The uplifting part is that the bishop crew is back together again. There's a special bond between men that serve, especially in combat. Thinking back, I don't remember my dad talking on the phone much, unless he was talking to one of his buddies. Those were long, loud conversations filled with laughter. Thanks for sharing him with us and thanks to Bill Davis for all you do to keep their memories alive. My sister, Lucille, and I have always kept Uncle Weido in our hearts. His love and support for our father, Frank, his older brother, always inspired me to appreciate our family. So sad to write that my Dad, Weido Chipoletti, has passed peacefully on 5/12/17. He was the last living on the Bishop crew. My brothers and I will toast the crew with the "short snorter' dollar bill we found in his memorabilia. Our sincere thanks to Bill Davis for detailing his service on this page. And a very special thank you to his crew and all that have served our country. As of 2/28/17, my father, Weido Chipoletti, is still alive and battling renal disease and some dementia. but he is almost 94 yrs old now and doing great for his age. Sadly, he is the last of his crew to still be with us. He still often speaks fondly of the bonds he and his crew made while fighting for our freedom. We recently realized in his collection of memorabilia from his service that he had a "short snorter" bill. This is a bill signed by all the crew members and was held as "good luck" by the owner. I will try to get a pic of the bill and signatures posted on this page soon. Weido, my dad used to talk about you, Pennington, and the others all the time. I too remember the stories of the plane going down in the Adriatic. He told me so many stories over the years, and I cherish the memories. Bill Davis, I'm grateful for the work you've put into this. My dad would've enjoyed reading them. Weido, when my dad passed away in 1991, I think you were one of the four crew members that came to the funeral. I never had the chance to thank you. That meant a lot to us. Thank you for your honorable service during the war, and know that all of you have been, and will forever be heroes in my book. My Uncle Weido is my father's brother. I am 75 years of age. Uncle Weido was a mentor to me for my whole life. I can remember his influence on my life from the time that I was about seven years old. Weido loved my father and they respected and loved all their family members. I was the sole caretaker for my father for more than ten years until my father died in January 2006. Weido always protected and helped my father in many ways. The "testicular fortitude" of these men at such a young age has appropriately earned them the nick name "The Greatest generation" and very rightfully so. All gave some.... And some gave all. Everyone of them are heroes in my book. I would like to thanks Bill Davis for his much appreciated work on this submission. Not hard to tell he, like myself, is very proud of these men and what they did to secure our, and many others, freedom. I love stuff like this! Hero is putting it lightly! Great story!!!! Thank you Mr Chipoletti for your service!! !